Nvidia today realized a software called 3DTV Play software , its an application that developed to interact in-between NVIDIA 3D Vision-enabled systems to a 3D HDTVs ready TVs. – Works with HDMI 1.4 3D TVs and compatible 3D glasses system, including Panasonic® VIERA® Full HD 3D Plasma TVs. – Enjoy crisp, stunning Blu-ray™ 3D movies in full 1080p HD playback. * Your GeForce GPU accelerates the video decoding to provide seamless 3D quality. – Converts your standard PC games into 3D so you can play over 475 PC games in stunning 3D environments, such StarCraft® II: Wings of Liberty™, Mafia® II, and Call of Duty® Black Ops™. – Browse 3D photographs on your 3D TV or view them in a slideshow with the included 3D photo viewing software. 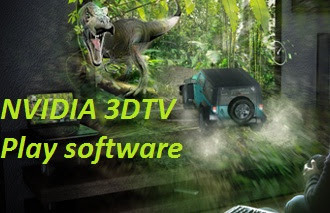 NVIDIA today announced the availability of its highly anticipated NVIDIA(R) 3DTV Play(TM) software, which allows users to connect NVIDIA 3D Vision(TM)-enabled notebooks and desktops to 3D HDTVs for the ultimate high-definition, big-screen entertainment experience. With NVIDIA 3DTV Play software, any compatible NVIDIA GeForce(R) GPU-powered system can be connected to a HDMI 1.4 3D HDTV. The combination enables users to view 3D photos and videos, and play nearly 500 games in breathtaking 3D environments, including StarCraft II: Wings of Liberty, Mafia II, and Call of Duty: Black Ops. When using compatible video playback software(1), NVIDIA 3DTV Play software users can watch Blu-ray 3D blockbusters on 3D HDTVs in full 1080p stereoscopic 3D, enjoying rich, HD digital surround sound through an HDMI connection to a compatible audio/video receiver(2).